En Papillote is a make shift bag made out of parchment paper. 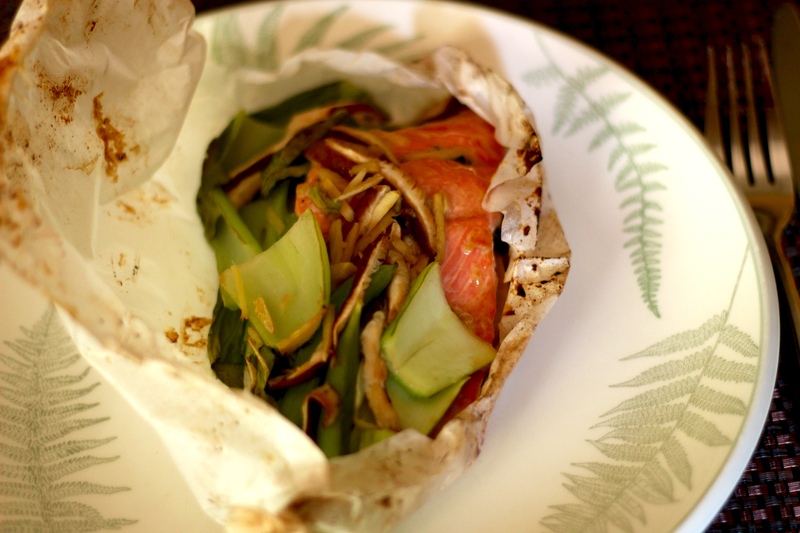 Making food in a bag is probably one of the healthiest ways you can prepare food. Your food will come out moist, tender with little fuss. 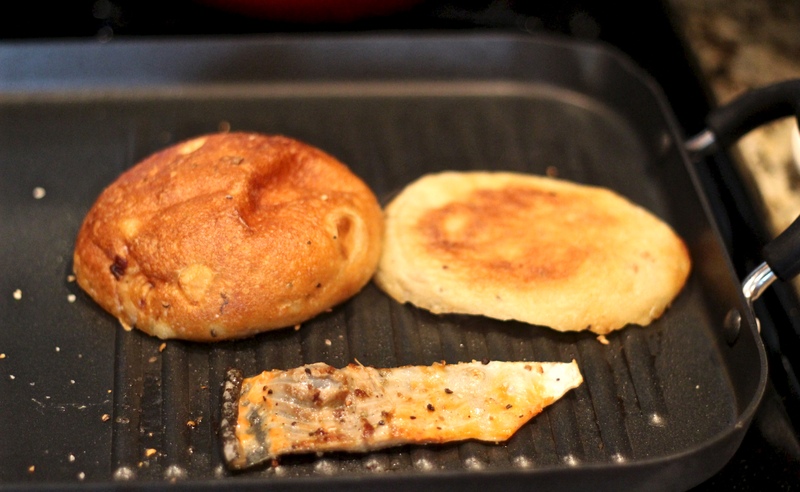 The parchment packet allows the fish and vegetables to cook in their own juices. My favorite part about using this method is you can throw a few ingredients into the parcels and all the work is done for you. You can prep these ahead of time and store in the refrigerator. Other than being pretty effortless, they look quite impressive when serving. 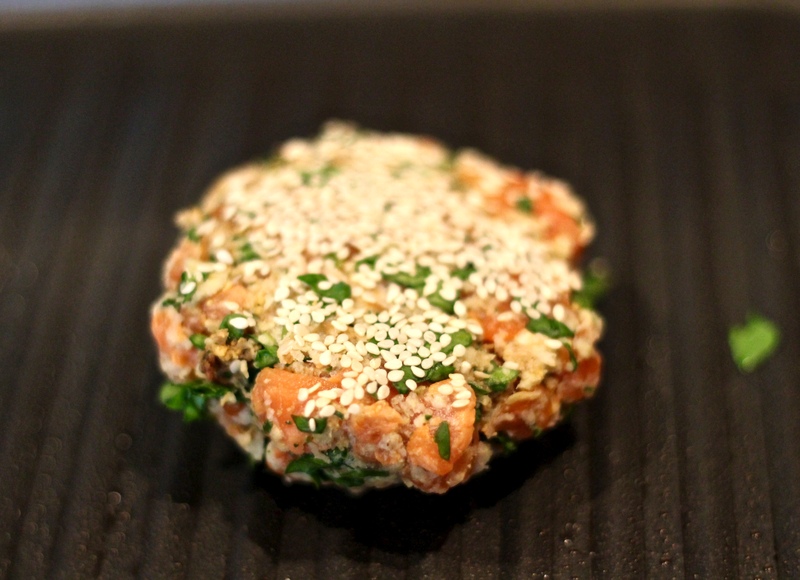 Serve with a ginger rice. Just add julienne-cut ginger when you add your rice to the boiling water. When I made my rice I was feeling especially adventurous and threw in some lemongrass as well. The combo with the fish was quite tasty. In a small bowl combine mirin, sake, miso paste, soy sauce, honey and sesame oil. Pat the fish fillets dry and place in baking dish skin side up. 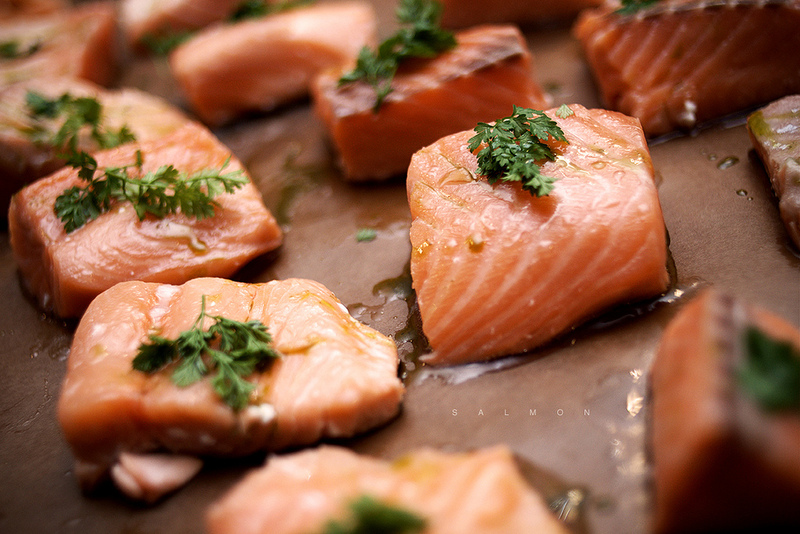 Spoon marinade over fish and turn them over a few times in the dish. 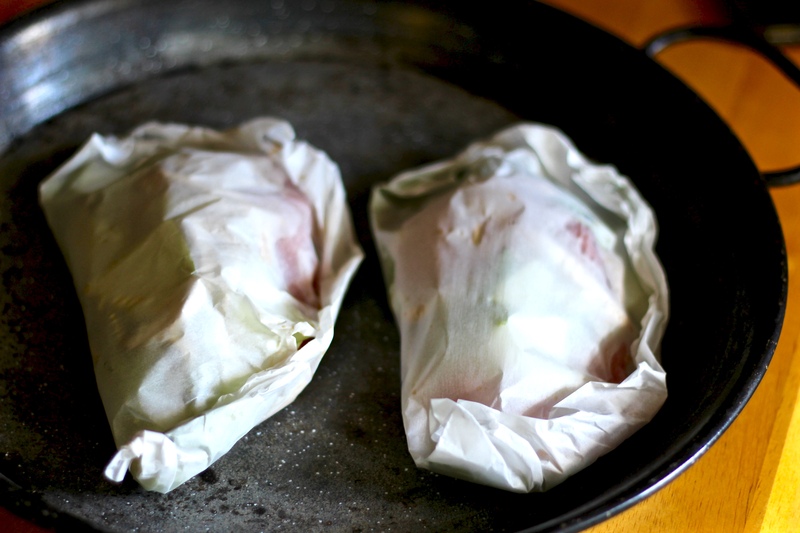 Cover with plastic wrap and keep in the refrigerator for 30 minutes to 1 hour. Tip: Do not go over an hour as miso is very salty. While fish is marinating prep all of the vegetables. Cut 4 (15 x 24-inch) pieces of parchment paper. Fold in half crosswise. Draw a large heart half on each piece, with the fold of the paper along the center of the heart. Cut out the heart, and open. Place one fillet near fold of each parchment heart. Top each fillet with 1/4 of the vegetables and ginger. 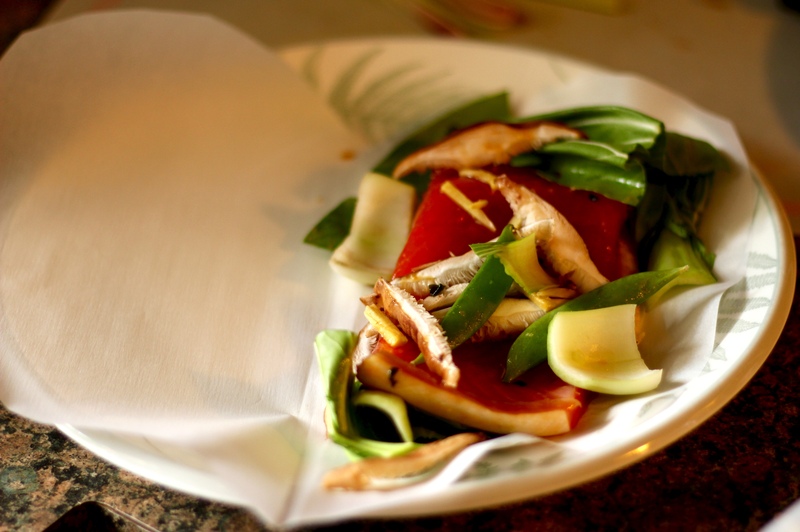 Tip: Let the excess marinade drip off the fish before placing on the parchment. The fish will release plenty of the marinade as it cooks to flavor the dish. 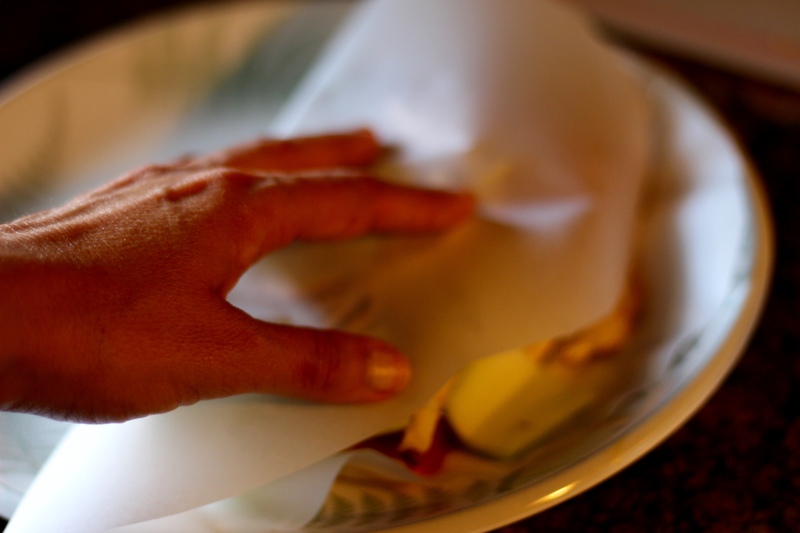 Fold the parchment over vegetables and fish. Starting at the top of the heart begin tightly folding the open edge of the parchment, sealing edges with narrow folds. Twist the end tip to secure tightly. Place packets on a baking sheet. Bake at 450° for 15 minutes. Place on plates; cut open. Top salmon with thinly sliced scallions. Serve immediately. Tip: If you wish a tighter seal, brush the edges of the paper with beaten egg white. 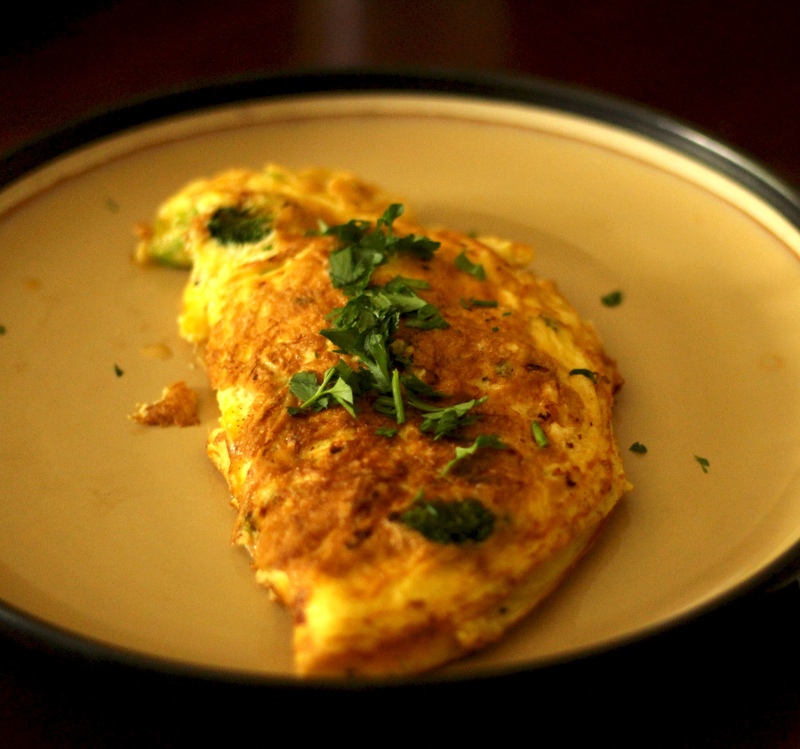 There is an art to making a good omelet quickly and perfect every time. Hearing such words seems so intimidating. The truth is the process is much simpler than you think. When you prep your ingredients make sure everything is cut bite sized. 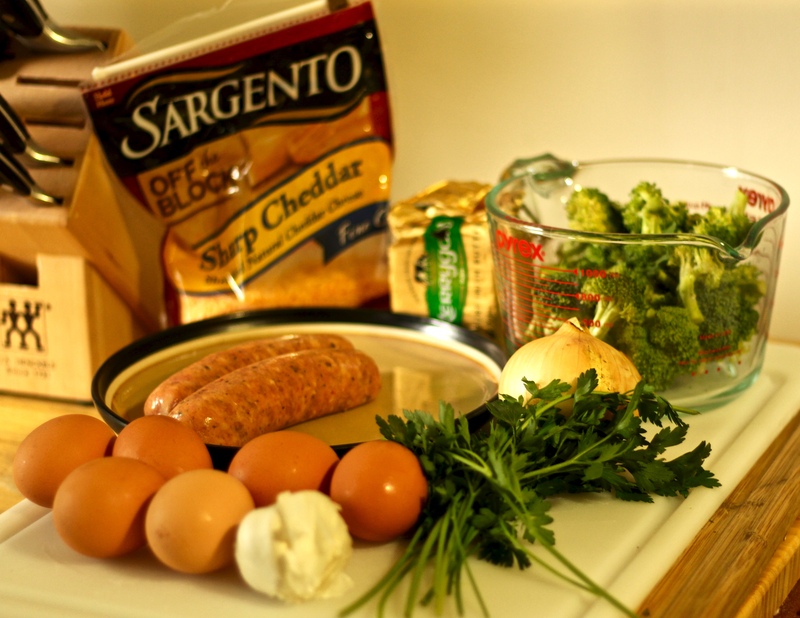 Don’t over load your omelet with too many ingredients, 3 to 4 with cheese and herbs is enough. What I love about omelets is you can serve both vegetarians and meat eaters quickly so all can eat at the same time. The ingredients listed below are proper ratio of eggs to fillers, making this recipe easily adaptable. If using only one pan, just make sure to cook the vegetarian omelets first. Heat butter in an 8 to 9 inch nonstick pan over medium-high heat. When butter stops foaming and just begins to color, add in 1/2 the onions and garlic. Sauté until onions start to look translucent, about 2 minutes. Add in 1/2 the sausage. Stirring occasionally cook until no longer pink, about 4 minutes. Then add in 1/2 the broccoli, 1/2 the parsley, salt and pepper to taste. Stirring occasionally cook until the broccoli is a brighter green, about 3 more minutes. Pour in eggs. Wait a few seconds until edges of the omelet begin to set. 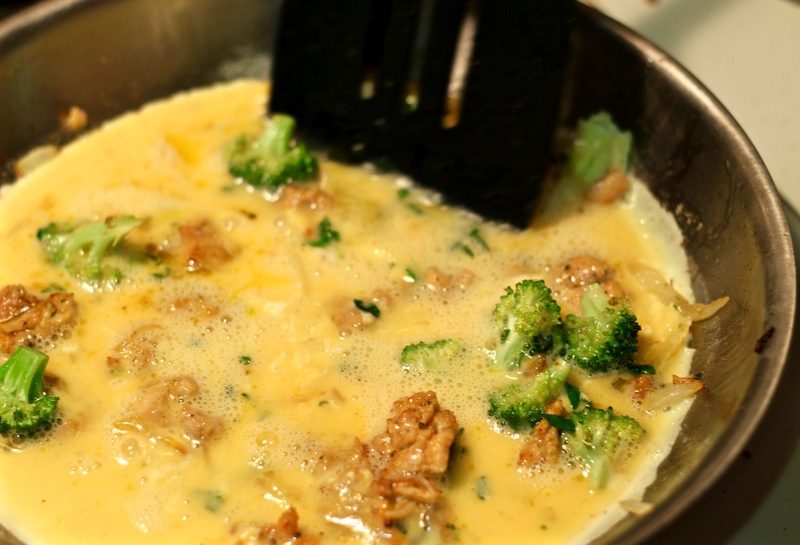 With the edge of a spatula, break-up the omelet in the center until slightly thickened. Tilt the pan to fill in any thin areas. Do not stir it or you will have scrambled eggs. Run your spatula around the edge of the omelet slightly lifting the edges of the omelet. Repeat steps 4 & 5 until omelet is just set but still moist on top. Sprinkle 1/2 the cheese over the omelet being sure to keep away from the edges. Cook a few more seconds to brown bottom. 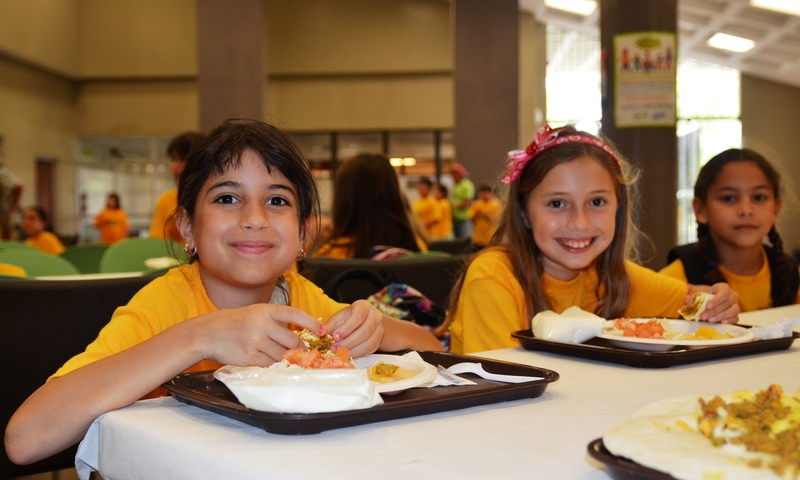 When top surface of eggs is thickened and no visible liquid egg remains, fold omelet in half with spatula. Gently slide omelet onto plate. Sprinkle with remaining g parsley and serve. 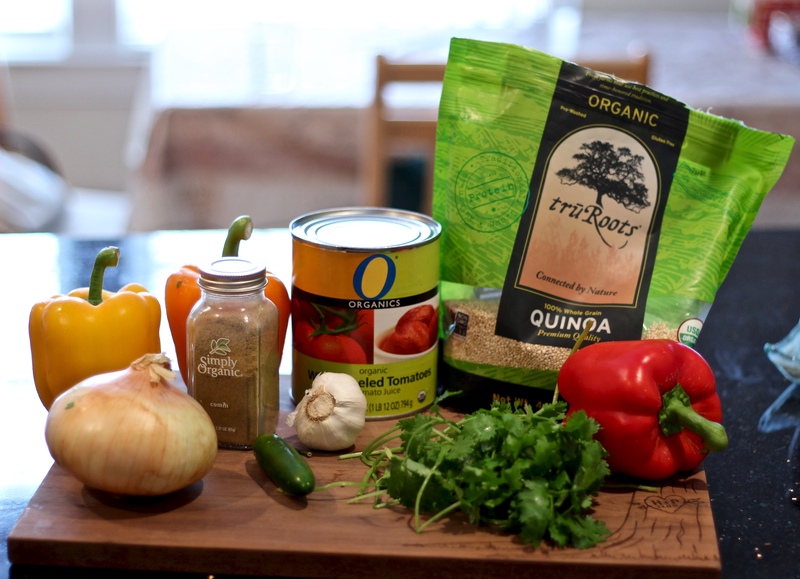 This weeks recipe was inspired by Quinoa. 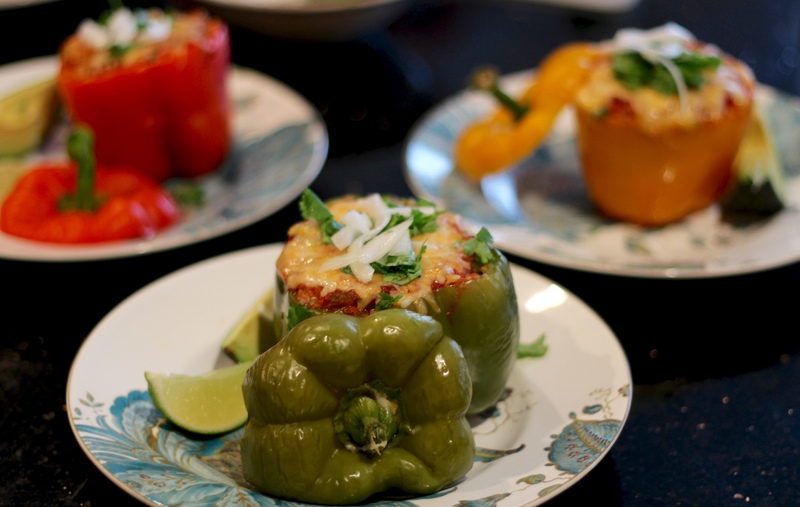 The Say No to Food Waste bloggers had a fun dinner get together of Stuffed Peppers, both vegetarian and with ground turkey. I like to use what is available when thinking up a dish and there was quinoa to spare. I went with a hispanic twist on the filling. 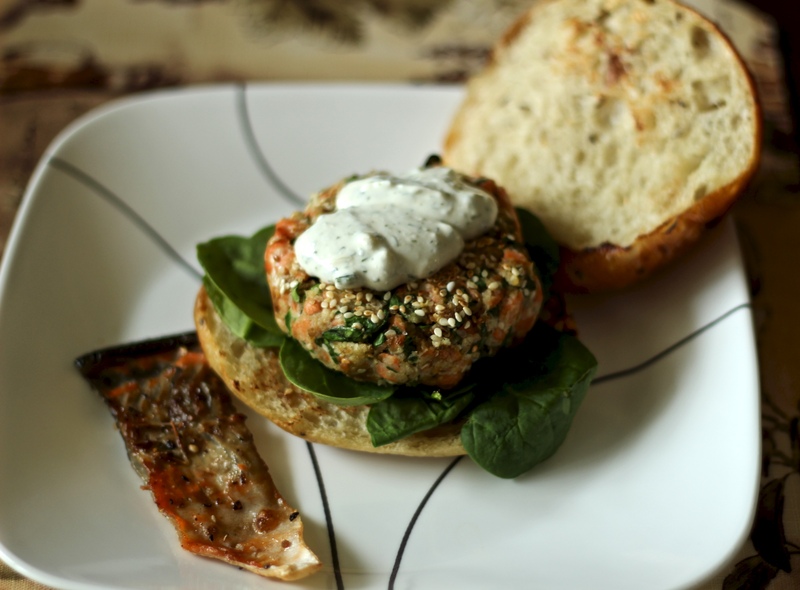 By swapping out the rice for quinoa they are healthier and surprisingly filling. 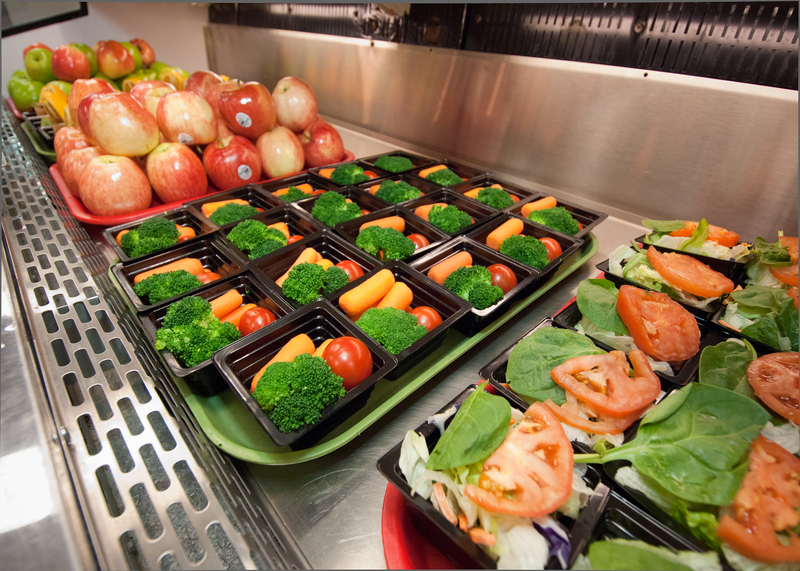 The ingredients and preparation process of the vegetarian and meat versions are separated below. This is to help impart the special flavors of South American cooking. Green peppers are one of the secrets to good black beans and colored peppers impart a sweetness to meats enhancing the flavor of the meat. 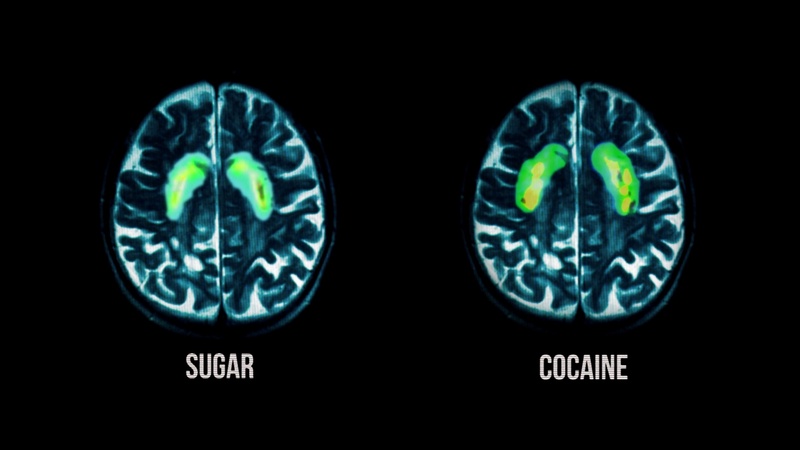 Try both, and let us know which you preferred. Bring 4 quarts water to boil in large stockpot. 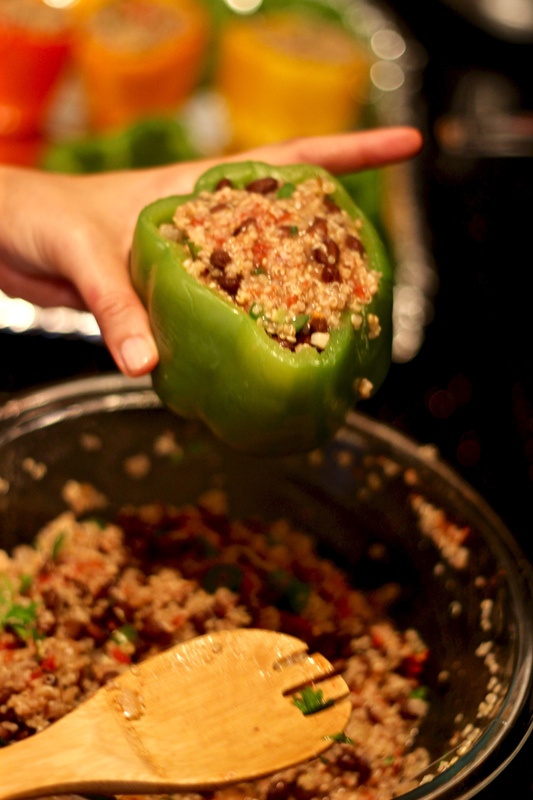 Add 1 tablespoon salt and bell peppers. Cook until peppers just begin to soften, about 3 minutes. 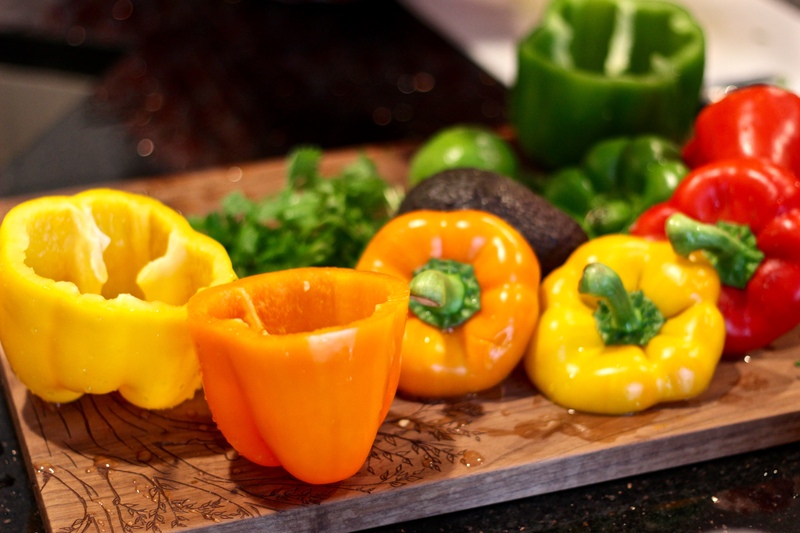 Using slotted spoon, remove peppers from pot, drain off excess water, and place peppers cut-sides up on paper towels. Return water to boil; add quinoa and bring back to a boil. Reduce heat and cover. Cook for 20 minutes. Drain quinoa and transfer to large bowl; set aside. Heat 12 inch sauté pan over medium-hi heat until hot, add oil and coat bottom with oil. Add onions stirring occasionally until browned, about 5 minutes. Add chopped Serrano pepper and garlic. Cook until fragrant, about 1 minute. Add in ground turkey cooking until no longer pink, about 4-5 minutes. Transfer mixture to bowl with quinoa; stir in tomatoes, 1/2 of the cheese, cilantro, and salt and pepper to taste. In a separate small bowl mix together salsa and reserved tomato juice. Place peppers cut-side up in 9-inch square baking dish. Divide filling evenly among peppers. 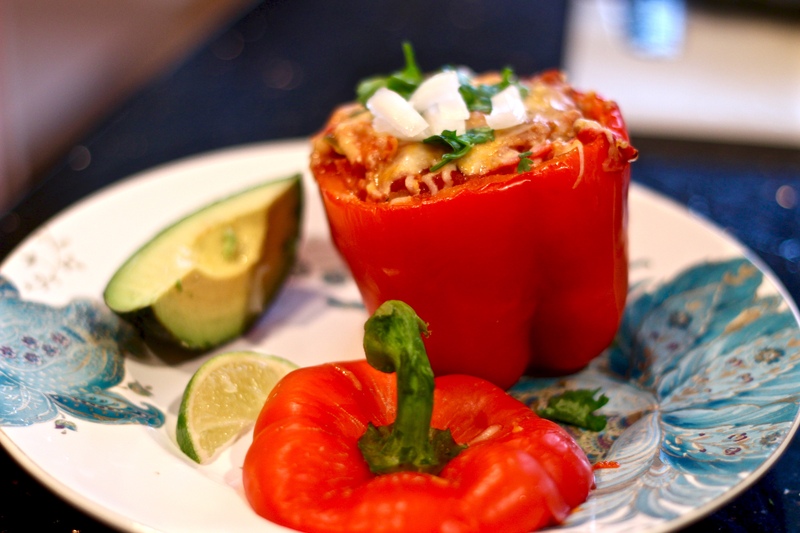 Spoon 2 tablespoons of salsa mixture over each filled pepper and sprinkle each with remaining cheese. Bake with pepper tops to the side until cheese is browned and filling is heated through, About 25-30 minutes. Serve immediately with toppings. place peppers cut-sides up on paper towels. 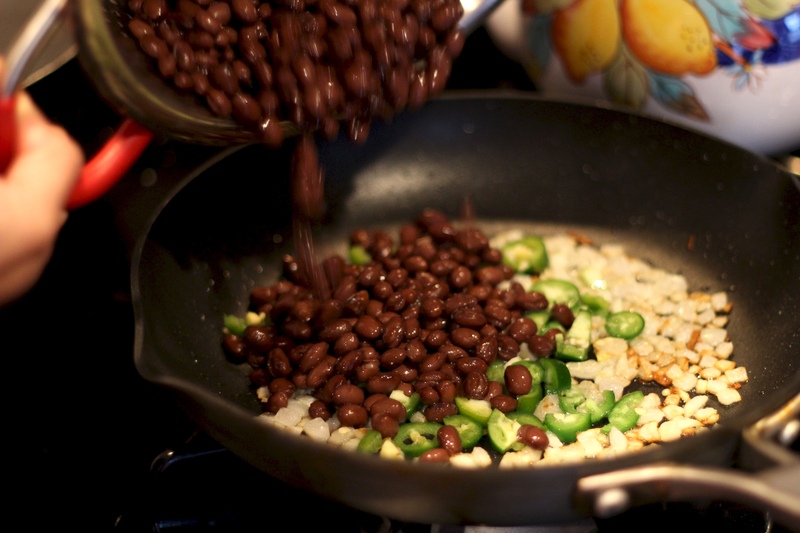 Add in beans, 1/4 cup of water, and cumin. Lightly mash the beans as you mix together. Cook for about 10 minutes stirring occasionally and lightly mashing the beans as you go. When looking for inspiration my favorite pastime is visiting a local farmer’s market. This past weekend I visited the farmers market in old town Kensington, MD. The cherries caught my eye, and I knew I wanted them to be the focus of my next dish. Unfortunately, they were so good I ate them all before the end of the day. 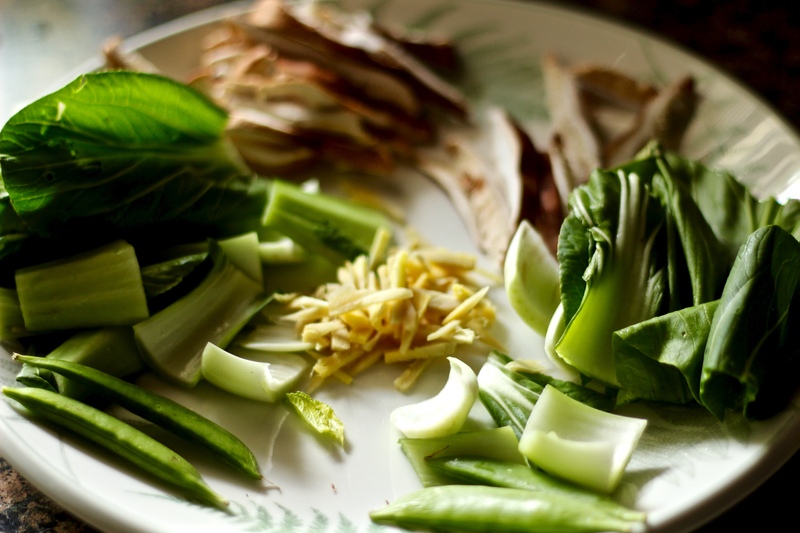 Cooking with what is in season always gives you the best value for taste, texture and nutrition. 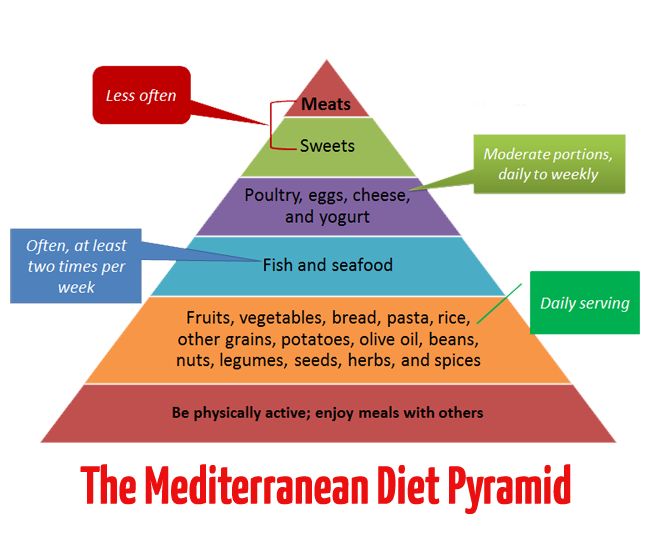 It is also another way to eat healthy and save money. Food that is in season is always cheaper and there is also the added benefit of local produce lasting longer since it doesn’t have to travel so far. Brush the chicken breasts on both sides with extra virgin olive oil and season with garam masala, salt and pepper. 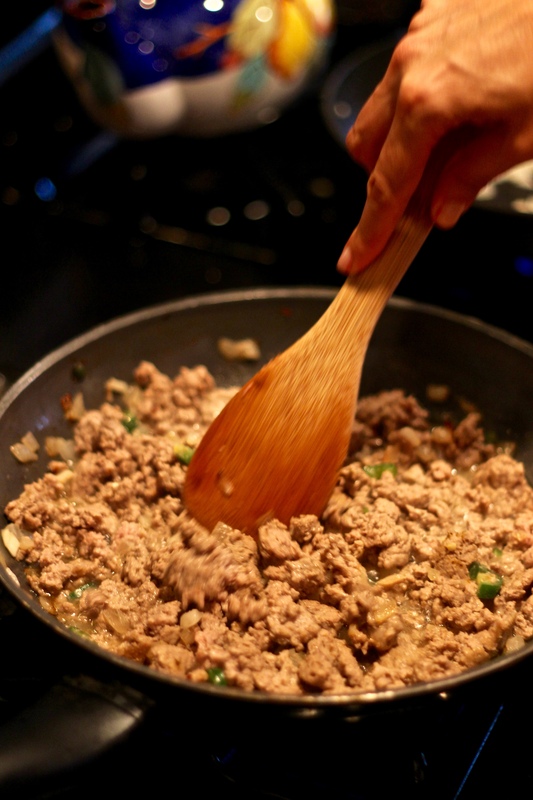 In a large skillet over medium heat add 1 tablespoon of butter. When pan is coated evenly with melted butter, brown chicken on all sides 3-4 minutes a side. Remove to a plate then tent with foil to keep warm. Melt 1 Tablespoon butter in same skillet then add shallots and saute until tender, 2 minutes. 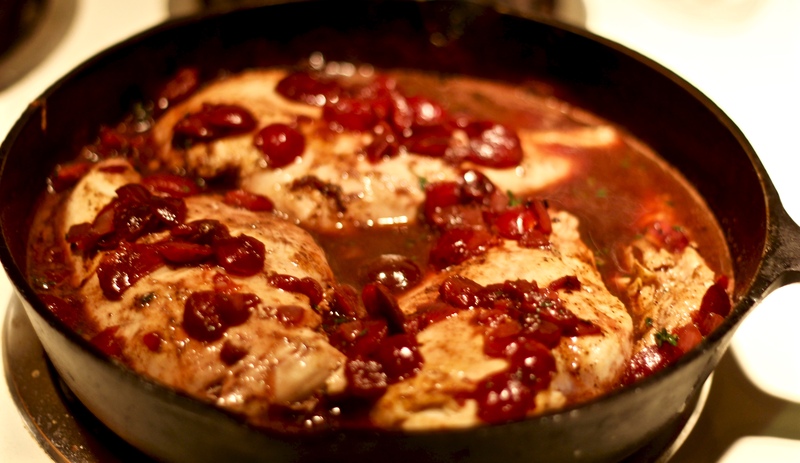 Add wine, chicken broth, balsamic vinegar, and fresh cherries, simmer until sauce is reduced by nearly half, 3-4 minutes. 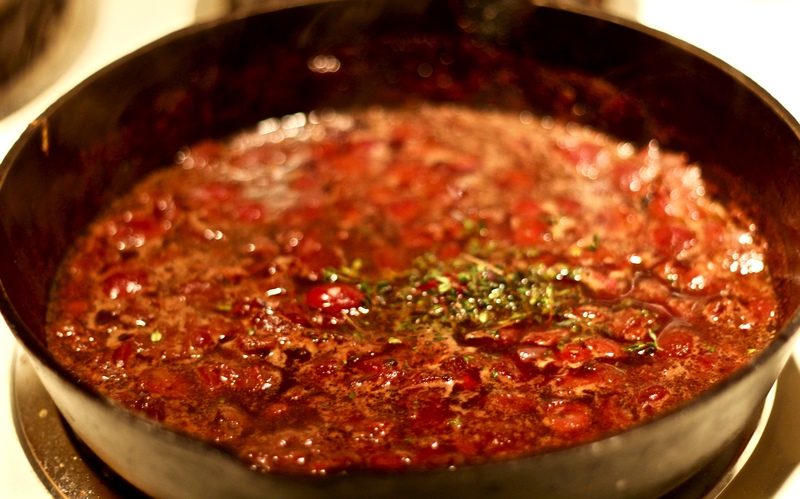 Add thyme then continue to reduce sauce until slightly thickened, 2-3 minutes, pressing down on cherries gently with the back of a wooden spoon. 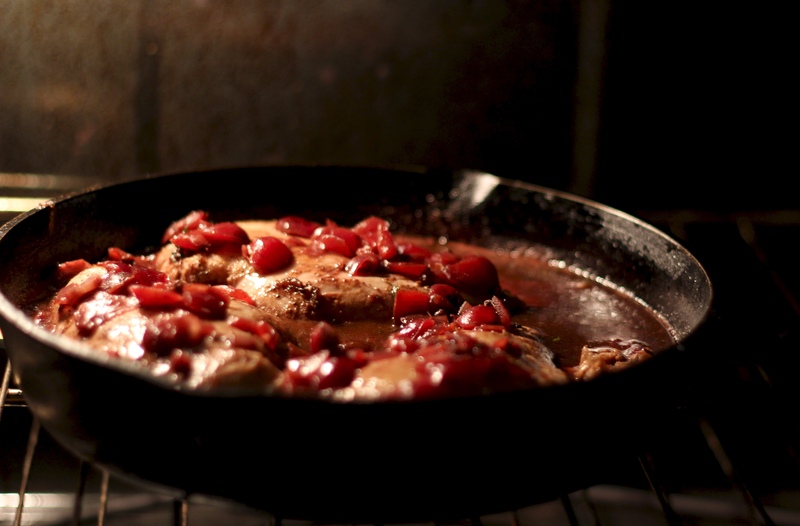 Return chicken to the skillet, top with cherry sauce. Transfer skillet to oven. Bake, uncovered, at 350° for 20 minutes. Remove skillet from oven then add in lemon juice. Be sure to incorporate it well then serve.